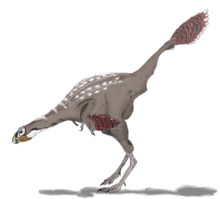 The hands of Caudipteryx supported symmetrical, pennaceous feathers that had vanes and barbs, and that measured between 15–20 centimeters long (6–8 inches). These primary feathers were arranged in a wing-like fan along the second finger, just like primary feathers of birds and other maniraptorans. No fossil of Caudipteryx zoui preserves any secondary feathers attached to the forearms, as found in dromaeosaurids, Archaeopteryx and modern birds. Either these arm feathers are not preserved, or they were not present on Caudipteryx in life. An additional fan of feathers existed on its short tail. The shortness and symmetry of the feathers, and the shortness of the arms relative to the body size, indicate that Caudipteryx was flightless. Caudipteryx is thought to have been an omnivore. In at least two specimens of Caudipteryx (NGMC 97 4 A and NGMC 97 9 A), gastroliths are preserved. As in some herbivorous dinosaurs, the avialan Sapeornis, and modern birds, these gastroliths remain in the position where the animals’ gizzards would have been. 1 2 3 4 Ji, Q.; Currie, P.J. ; Norell, M.A. ; Ji, S. (1998). "Two feathered dinosaurs from northeastern China" (PDF). Nature. 393 (6687): 753–761. Bibcode:1998Natur.393..753Q. doi:10.1038/31635. 1 2 Zhou, Z.; Wang, X. (2000). "A new species of Caudipteryx from the Yixian Formation of Liaoning, northeast China" (PDF). Vertebrata PalAsiatica. 38 (2): 113–130. ↑ Osmolska, H., Currie, P.J., and Barsbold, R. (2004). "Oviraptorosauria." In Weishampel, Dodson, Osmolska (eds.) The Dinosauria, second edition. University of California Press, 2004. 1 2 Zhou, Z.; Wang, X.; Zhang, F.; Xu, X. (2000). "Important features of Caudipteryx - Evidence from two nearly complete new specimens" (PDF). Vertebrata PalAsiatica. 38 (4): 241–254. ↑ Xu, X.; Norell, M.A. (2006). "Non-Avian dinosaur fossils from the Lower Cretaceous Jehol Group of western Liaoning, China". Geological Journal. 41: 419–437. doi:10.1002/gj.1044. 1 2 Dyke, Gareth J.; Norell, Mark A. (2005). "Caudipteryx as a non-avialan theropod rather than a flightless bird" (PDF). Acta Palaeontologica Polonica. 50 (1): 101–116. ↑ Turner, Alan H.; Pol, Diego; Clarke, Julia A.; Erickson, Gregory M.; Norell, Mark (2007). "A basal dromaeosaurid and size evolution preceding avian flight" (pdf). Science. 317 (5843): 1378–1381. doi:10.1126/science.1144066. PMID 17823350. 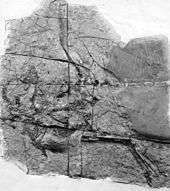 ↑ Osmólska, Halszka, Currie, Philip J., Barsbold, Rinchen (2004) The Dinosauria Weishampel, Dodson, Osmolska. "Chapter 8 Oviraptorosauria" University of California Press. ↑ Lü, J., Dong, Z., Azuma, Y., Barsbold, R., and Tomida, Y. (2002). 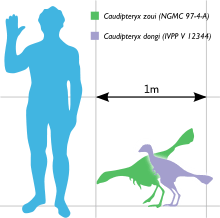 "Oviraptorosaurs compared to birds." In Zhou, Z., and Zhang, F. (eds. ), Proceedings of the 5th Symposium of the Society of Avian Paleontology and Evolution, 175–189. Beijing Science Press. ↑ Maryańska, T.; Osmólska, H.; Wolsan, M. (2002). "Avialan status for Oviraptorosauria" (PDF). Acta Palaeontologica Polonica. 47 (1): 97–116. ↑ Martin, Larry D. (2004). "A basal archosaurian origin for birds". Acta Zoologica Sinica. 50 (6): 978–990. ↑ Martin, L.D. ; Czerkas, S.A. (2000). "The Fossil Record of Feather Evolution in the Mesozoic" (PDF). American Zoologist. 40 (4): 687–694. doi:10.1668/0003-1569(2000)040[0687:TFROFE]2.0.CO;2.